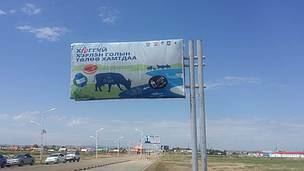 Over 3000 people from Dornod, Khentii province and Baganuur district collected total of 105 tons of garbage where the Kherlen River flows through. WWF-Mongolia introduced “Plastic free Rivers” initiative in order to remove plastic waste from rivers and to engage stakeholders. A successful launch of this initiative continues in the eastern part of the country, Kherlen River. In particular, a meeting was held in Khentii province on 19 July 2018, to discuss cooperation and opportunities of parties to implement Kherlen River’s plastic waste disposal. Representatives from Dornod, Khentii, Baganuur, and WWF-Mongolia participated in the meeting. The parties agreed one of the issues Kherlen River facing is a waste and they exchanged views on how to solve this problem. Within this framework, a nationwide cleaning of the Kherlen River will be organized in July 2018 and will promote publicity of plastic waste. The sides also developed a work plan for the coming fall and expressed their willingness to work for a successful campaign. Over 3000 people from Dornod, Khentii province and Baganuur district collected total of 105 tons of garbage where the Kherlen River flows through. In addition, trash bins have been placed along the river banks, as well as billboards were set-up near the checkpoints to provide information of the campaign. People go to river banks to relax, but they litter plastic bottles and bags. Therefore, the organizers point out that they will continue to pay attention to the promotion of plastic wastes to the public. The sides have developed detailed work plans for the year and expressed their willingness to work for a successful campaign.